Mr. Hamane – The new HRC President – has read our post and after some deals with Miguelona’s Manager – Mr Cyteck– She has signed a 2 years contract to compite in the 8o CC superbunny series. The team is still negotiating her debut in upper categories due to her outstanding physical condition. Enclosed you will find a picture of the event in which the Miffa-Wifibunnies team was presented. Congratulations!!! 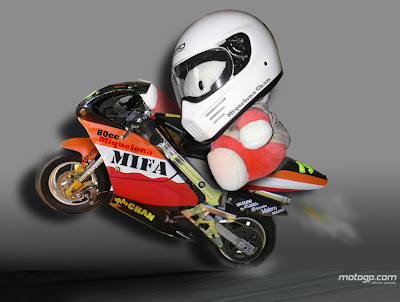 I look forward to more fabulous photos of a racing Miquelona! Now all the pressure is on the general manager. Mr Cyteck. And sure he will keep the tempo!!! Hi! I’m cousin Miffer !! I’ve posted something at wifiblanes blog !! I am glad my cousin has been having fun with you at FIB.